In its purest distillation — no goat cheese, fried eggs or jams of various kinds — a burger that is really just a burger can be an extremely comforting and enjoyable meal. The version served up at Meg's Hamburgers hits the mark. Growing up in Seattle, I got nearly five years’ worth of vegetarianism out of the way before I turned 18 thanks to an early exposure to the “Simpsons” episode where Lisa gives up meat. These days, I try not to eat a surfeit of meat for slightly different reasons, but a well-done classic hamburger remains a go-to treat. 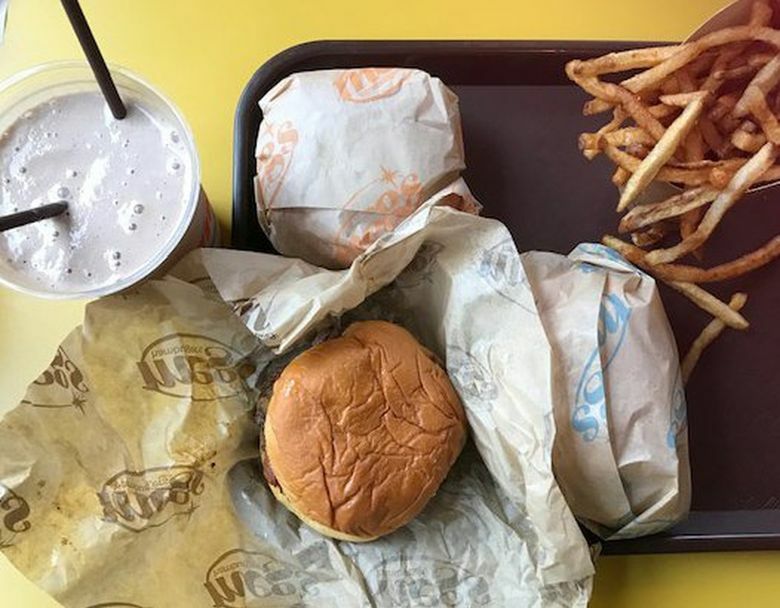 So when Meg’s Hamburgers opened in Pioneer Square, promising classic and cheap burgers in a quadrant of the city where I once endured far too many sad weekday salad-bar lunches as a broke nonprofit employee, I immediately asked to review it. My extremely weak argument — that someone named Meg should be the one to review Meg’s — was somehow taken seriously, and soon enough, A+ partner-in-lunch Bethany Jean Clement and I were climbing into a powder-blue booth (“bouncy” was Bethany’s apt description) to feast on as many Meg’s offerings as we could try in one sitting. First, the good: Meg’s shakes are coolly thick without being straw-impervious, sweet without being cloying. We sampled the chocolate variety ($4.50) and it was everything you’d hope a good, basic chocolate shake would be. Other flavors include vanilla, coffee and a rotating seasonal choice. “Basic” is the overall vibe at Meg’s, and I don’t mean that in the dismissive I-hate-vanilla-lattes sense of the word. (I LOVE vanilla lattes, don’t @ me.) I mean that in its purest distillation, a burger that is really just a burger can be an extremely comforting and enjoyable meal. The French fries ($3, fried in beef fat, vegan upon request) are also solid, but the true sleeper hit of this menu is … SURPRISE! Something called a Fishwich! Eight bucks buys you a rather large portion of fried cod on a bun with mayo, lettuce and pickles. The breading was nicely crisp, and the fish tasted fresh. To my palate, it packed a dopamine drop similar to the one you get from a fried chicken patty with a little melted cheese on top — something about the interplay between the crunchy coating of the meat and the mellow dairy makes for a satisfying protein bomb. I did not want to try this $9 concoction, listed only as “Seattle” on the menu, but Bethany, intrepid food columnist that she is, insisted. Though I admired her bravery, this proved to be a mistake. It’s one thing to eat a Seattle dog when you’re all danced out on Capitol Hill at 2 a.m. and waiting for a Lyft home, your senses dulled with post-revelry exhaustion and too many Rainier tallboys. It’s quite another to eat a Seattle dog on top of a hamburger in the sober light of day, in a restaurant in Pioneer Square, surrounded by hurried lunch-breakers, when you have to go back to the office later to wrap up your editing for the week and have no Tums in your purse. But I’m going to give Meg’s the benefit of the doubt here. 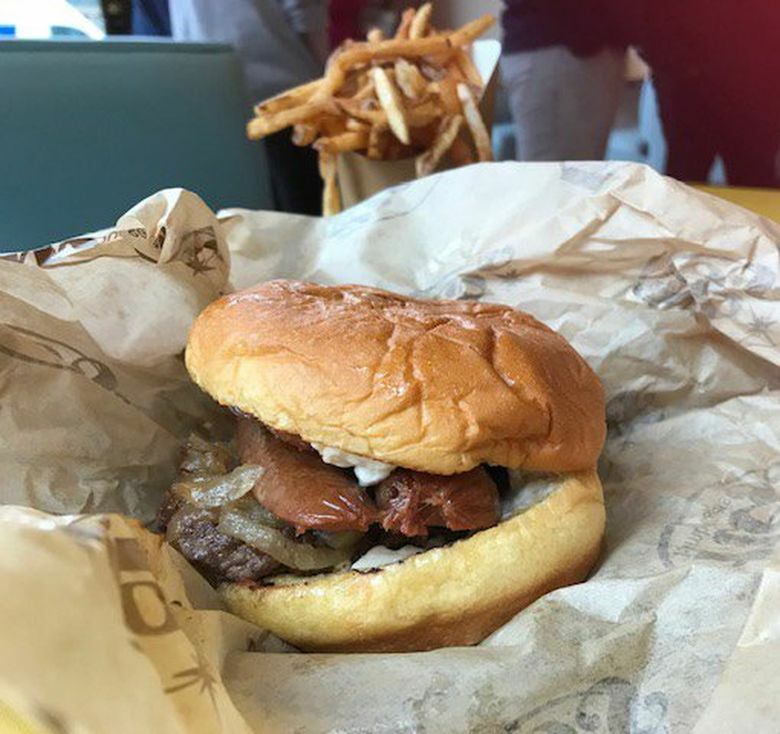 Because when it comes to hamburger restaurants, the availability of a well-made basic hamburger is really what counts, and there, Meg’s hits the mark.